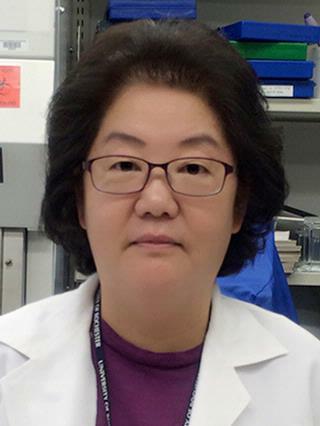 Dr. Lee's research interest is in elucidating the molecular mechanisms involved in chemo- and radioresistance of lung cancer cells. Zhu R, Yang X, Xue X, Shen M, Chen F, Chen X, Tsai Y, Keng PC, Chen Y, Lee SO, Chen Y. "Neuroendocrine differentiation contributes to radioresistance development and metastatic potential increase in non-small cell lung cancer." Biochimica et biophysica acta. Molecular cell research.. 2018 Dec 0; 1865(12):1878-1890. Epub 2018 Sep 15. Shen M, Chen Y, Xu L, Zhu R, Xue X, Tsai Y, Keng PC, Lee SO, Chen Y. "Increased infiltration of macrophages to radioresistant lung cancer cells contributes to the development of the additional resistance of tumor cells to the cytotoxic effects of NK cells." International journal of oncology.. 2018 Jul 0; 53(1):317-328. Epub 2018 May 04. Xu L, Shen M, Chen X, Zhu R, Yang DR, Tsai Y, Keng PC, Chen Y, Lee SO. "Adipocytes affect castration-resistant prostate cancer cells to develop the resistance to cytotoxic action of NK cells with alterations of PD-L1/NKG2D ligand levels in tumor cells." The Prostate.. 2018 Apr 0; 78(5):353-364. Epub 2018 Jan 12.